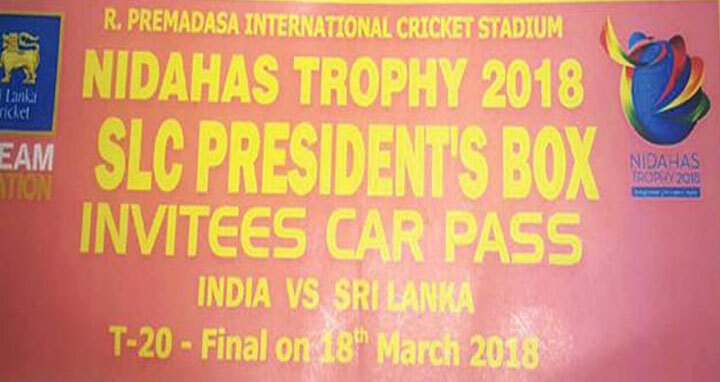 Dhaka, 17 Mar, Abnews: The Sri Lankan Cricket Board (SLC) has created controversy after car passes of the final match of ongoing Nidahas Trophy 2018 were distributed to high officials which stated that the match will be contested by India and Sri Lanka. Following the shocking discovery, people are asking whether the Nidahas Trophy organisers underestimated the Tigers. BCB President Nazmul Hasan Papon was also reportedly provided the car pass. Asked about the matter, BCB Director Ismail Haidar Mallik said that they indeed were provided with the car pass-two-three days back. Replying to the obvious question that why nothing was said regarding the issue then, Mallik said that they only brought the matter into notice after Bangladesh proved the doubters wrong by earning their place in the final beating hosts Sri Lanka in a cliffhanger on Friday.